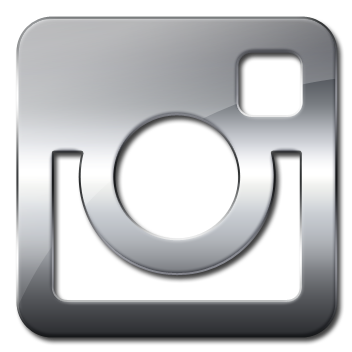 Welcome to another challenge starting over at Try it on Tuesday. This time around our theme is another favourite of mine - THEY WHO HAVE WINGS. I can't wait to see what you come up with! I decided I wanted to try and make a card without using a single Tim Holtz product, so this entire card was done using DecoArt paints and Copic markers. Sorry Tim, had to be done! The background was painted with DecoArt Crafter's Acrylics Cherry Blossom, Turquoise, Lavender and Tropical Blue. I blended them together with water and splashed a little Americana Titanium on the top. The brick layer was done with home made texture paste and a home made brick stencil. I painted it with DecoArt Americana Acrylics Hauser Green and Avocado. I dabbed a little Titanium White on the top. I coloured the ribbon with DecoArt paints as well. 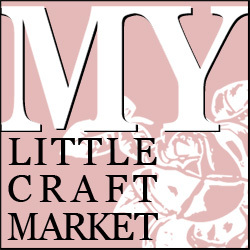 The butterfly is made from crafter's clay and a Martha Stewart mold. I painted it green and highlighted it with white paint. 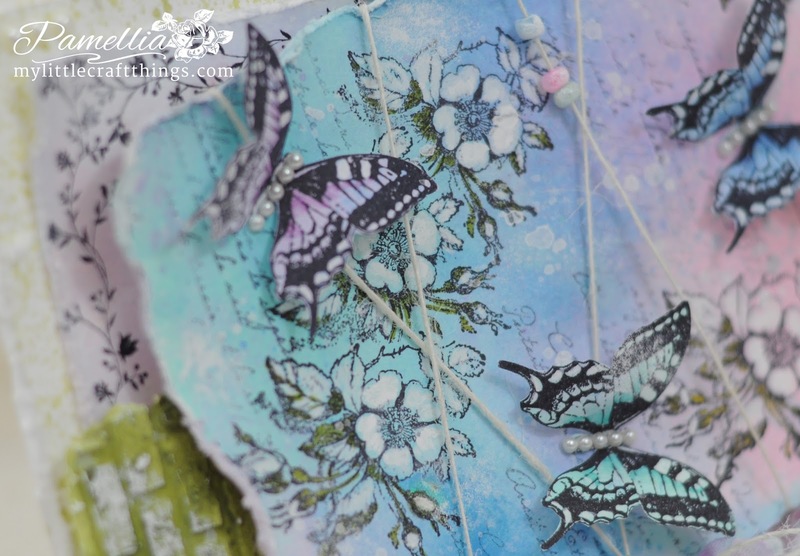 The border vine stamp is from Kaisercraft and so are the butterflies. The script stamp is from BoBunny. All the stamping was done with Ranger Archival ink Jet Black. The butterflies were coloured with Copic markers. The two back layers were coloured using watered down versions of the same colours of paints. 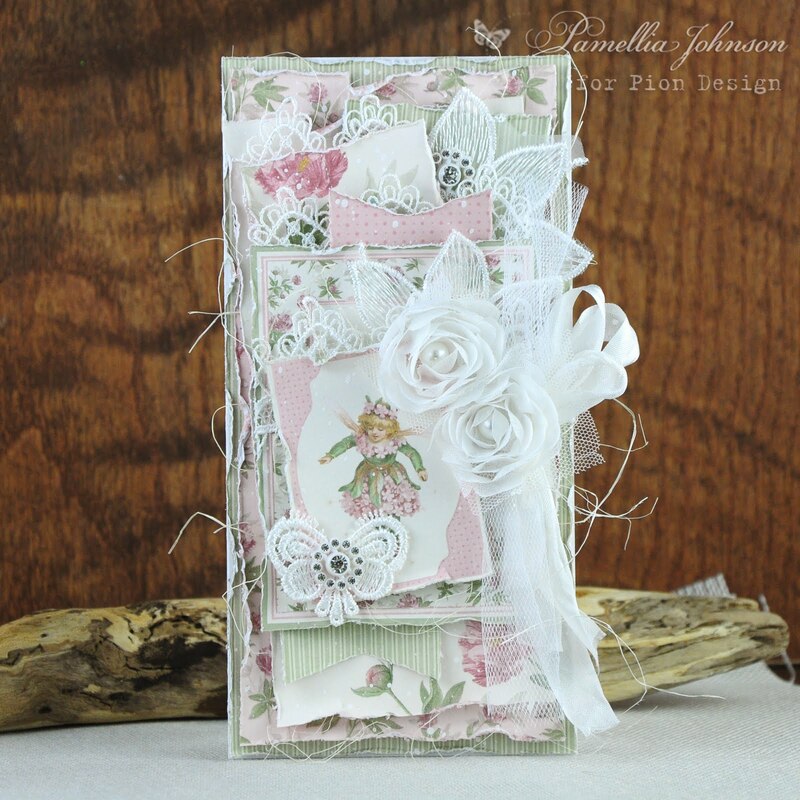 The flowers are made of two stamps from the LaBlanche Rosebuds set. I masked and stamped them several times to create a bouquet. I coloured the flowers with a white pencil crayon, and touched them up with Titanium White and Avocado paints. 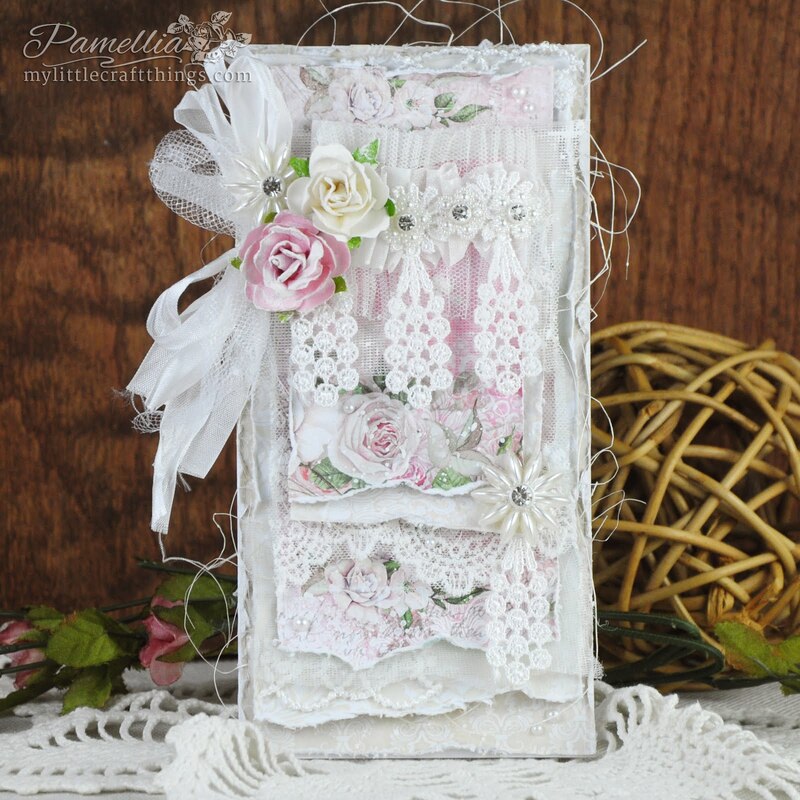 Totally lovely, dreamy creation, Pamellia. Love all you've put on this with your magic fingers. Beautiful! Yay, texture paste! I am impressed that you made the brick stencil, and that you made a mask for that detailed flower stamp. The way you faded the colors is so pretty, too. Love this! Eeek!! That rainbow of colour is divine!! I adore your creation ... so beautiful Pamellia! 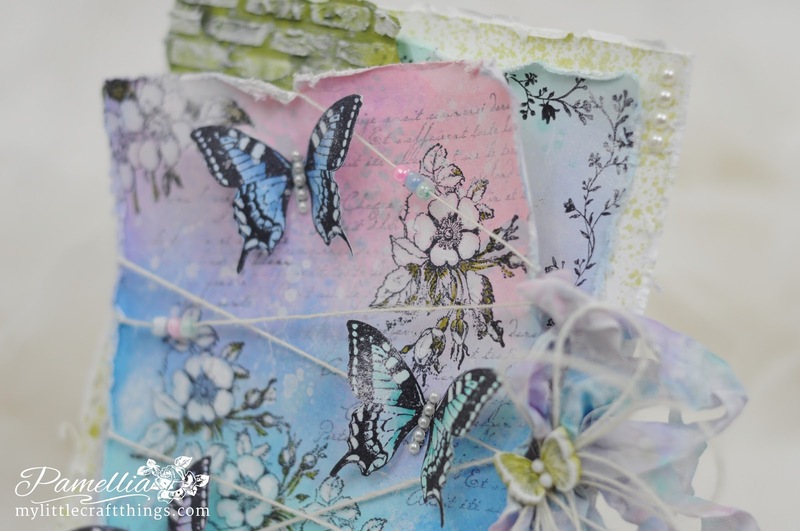 love all those torn edges, the stamping, the fluttering butterflies and that beaded string wrapping !! Awesome Pamellia !! Ooh love this one Pamellia,the colours are sugary and sweetness. Love the bricks showing too.....another stunning creation! A beautiful fusion on soft pastel colours today Pamellia and always love a butterfly or two and the brickwork backing works a treat. A delightful array of pastel shades and texture here, I love it. 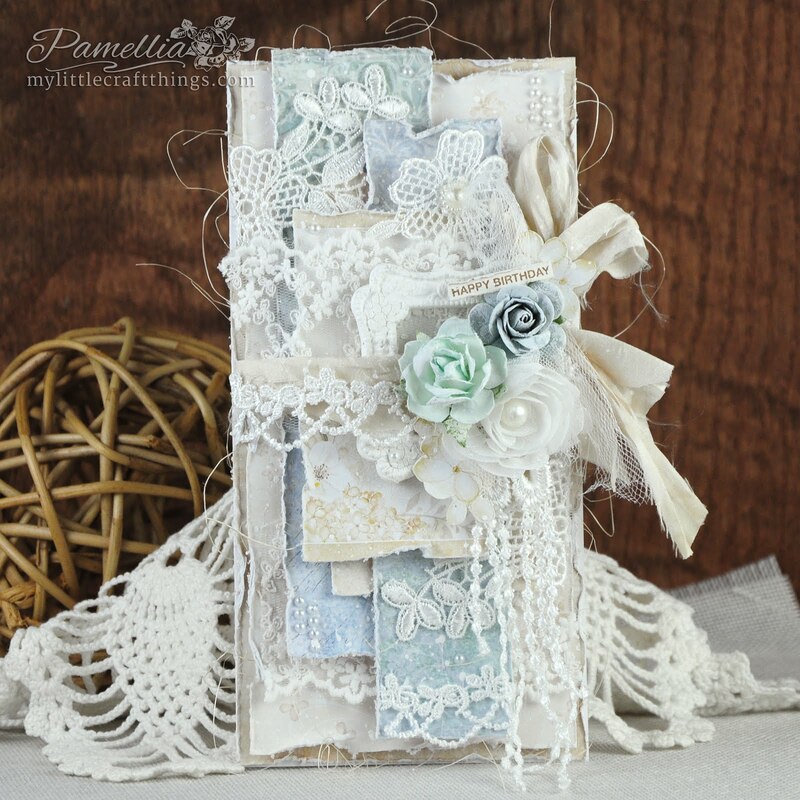 Pamellia you have outdone yourself again...the colours, images and whole card are full of beauty...loving this..
Love the pastel colours of your card. Beautiful and girly! I so love the softness and all the layering and textures ..and how beautiful all colors and details are together --MASTERLY Pamellia! Another "sigh" so very beautiful, those butterflies having just landed to take a look at the gorgeous colours. Another I LOVE it. PS I don't know how you do it, but 90% of the time you are the first to comment on my cards. Thank you so very much, it is very much appreciated. Especially as we are "in different fields". Wonderful design with the brick wall layer and beautiful layered butterflies! 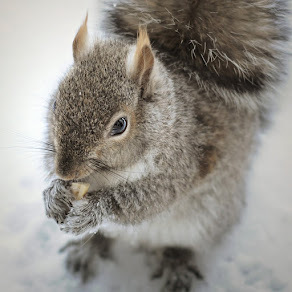 So beautiful ! i loved the background with pretty colors n stamping ! WOW! Pamellia, this is stunning, love the colours used, love the brick wall that looks so fab. The butterflies are beautiful and I love how you have crossed over the twine and added beads for decoration. Fabulous creation my friend. A gorgeous feminine project. I'm sure Tim will forgive you for not using his products. 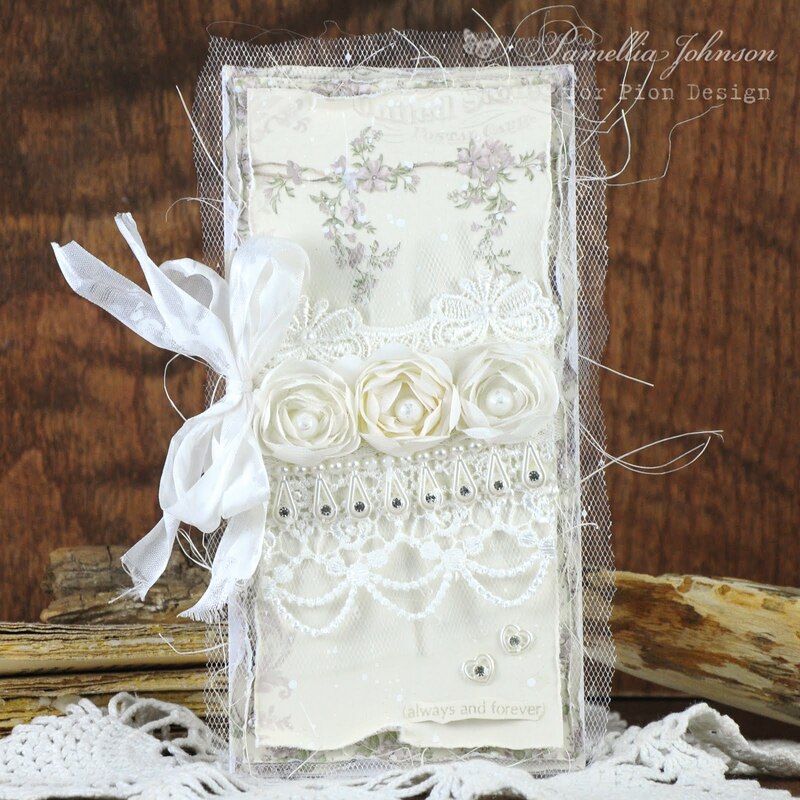 Very beautiful project and fabulous embellishments. I love it! 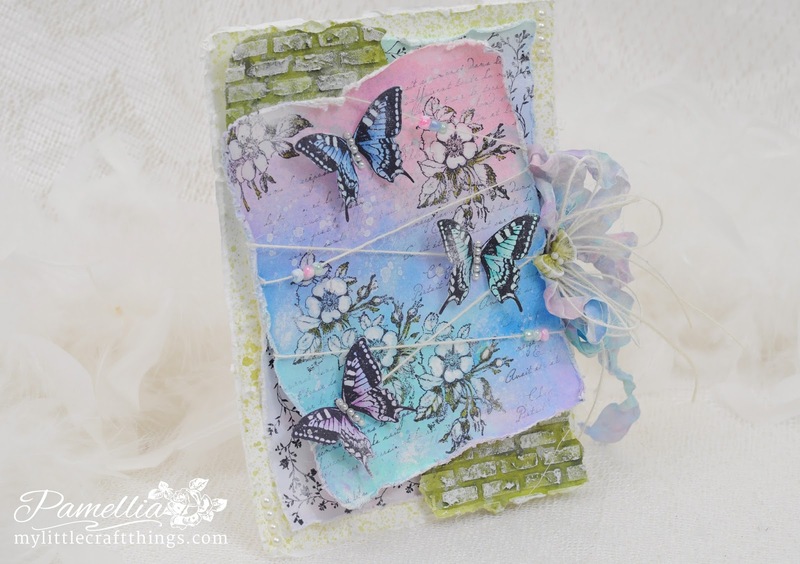 Such a pretty card love the soft pastel colors and one can never have too many butterflies and flowers they go so well together . Thanks for sharing . Your card is gorgeous! I love butterflies! Thank you for joining the Butterfly Challenge! I like how you interpreted our C for Corners theme! 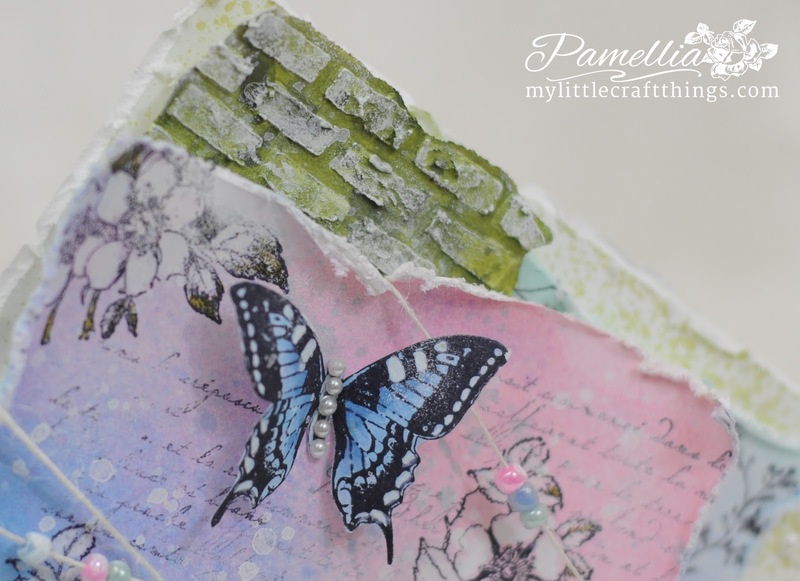 This is stunning Pamellia, the colours are gorgeous and the texture looks amazing. I love the pretty butterflies too. This is gorgeous Pamellia! 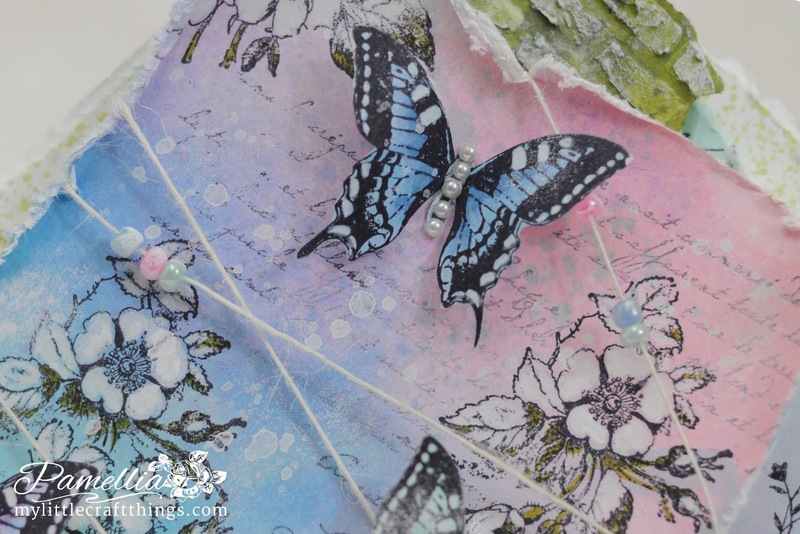 I love the different stamps you've used, your beautiful butterflies and the added beads are fabulous! 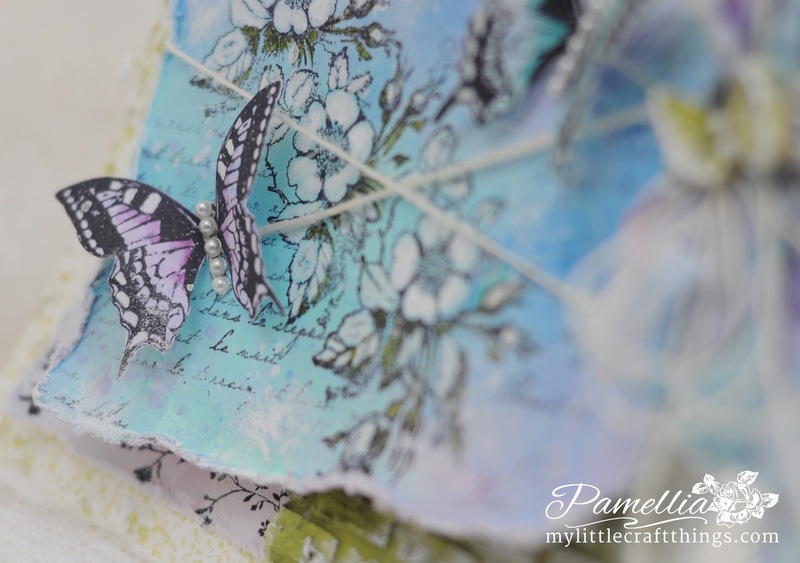 I love the colours and shading on this one Pamellia, so pretty, love the butterflies and your tiny pearls, gorgeous! 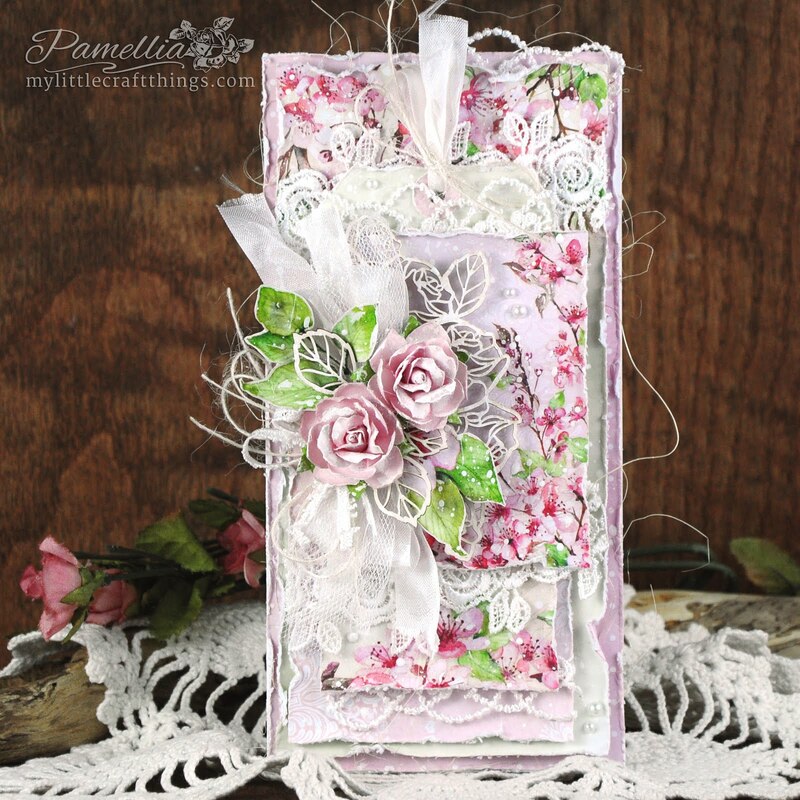 This card is so pretty, Pamellia! 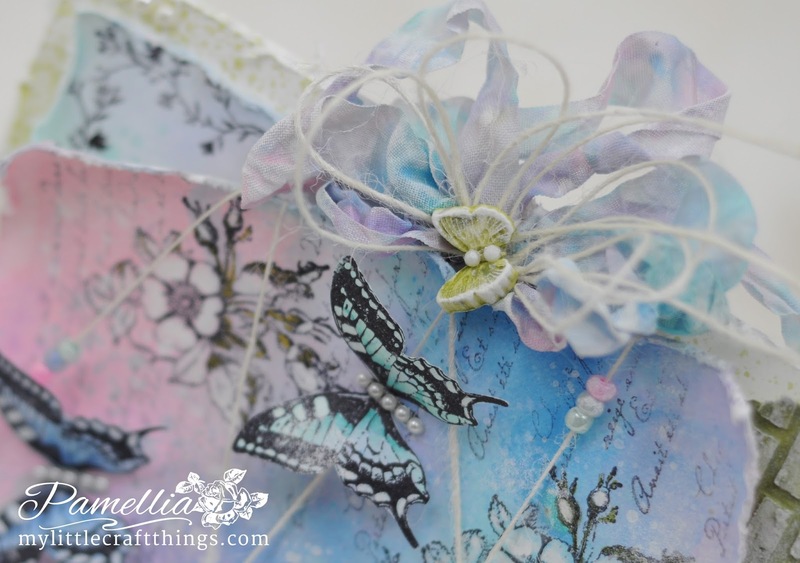 I love the colors, butterflies, and the string and beads wrapped around the card. WOW, Pamellia! Beautiful card! It`s very spring, pastel and delicate! Beautiful butterflies with pearls! White cord is used interesting! 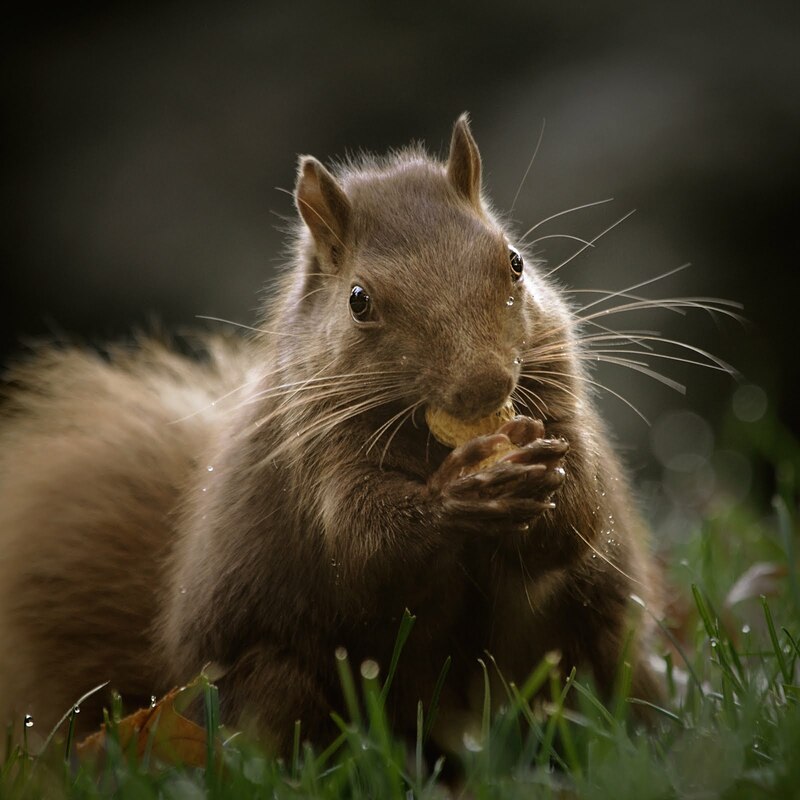 Gorgeous Pamellia, it's just everything about it, the images, the colours, love it all and thanks for the visit. Wow! You have taken my breath away. Who needs Tim anyway. Lol. Gorgeous , gorgeous colours and the design is pure crafty ness. Love it Thankyou for fluttering by my 27. Hugs Mrs A.
Wow, Pamellia, you may have left our friend Tim out of the equation, but his addition certainly won't be missed on this occasion. Your card is stunning (as always), with so many wonderful details. I love every element, but that brick wall really 'grabbed ' me, and the threaded beads are a cute addition. Thank you for your words of encouragement...they mean such a lot to this little bunny with her 'L' plates in the world of mixed media. Such a gorgeous creation, Pamellia. The brick work is stunning... like that you chose an unusual color for it... LOVE it! Your card card is truly a work of art! stunning, luv the distressed edges...awesome! so glad you played along with Simon Says Stamp Wednesday Challenge! Nice that card butterflies ! 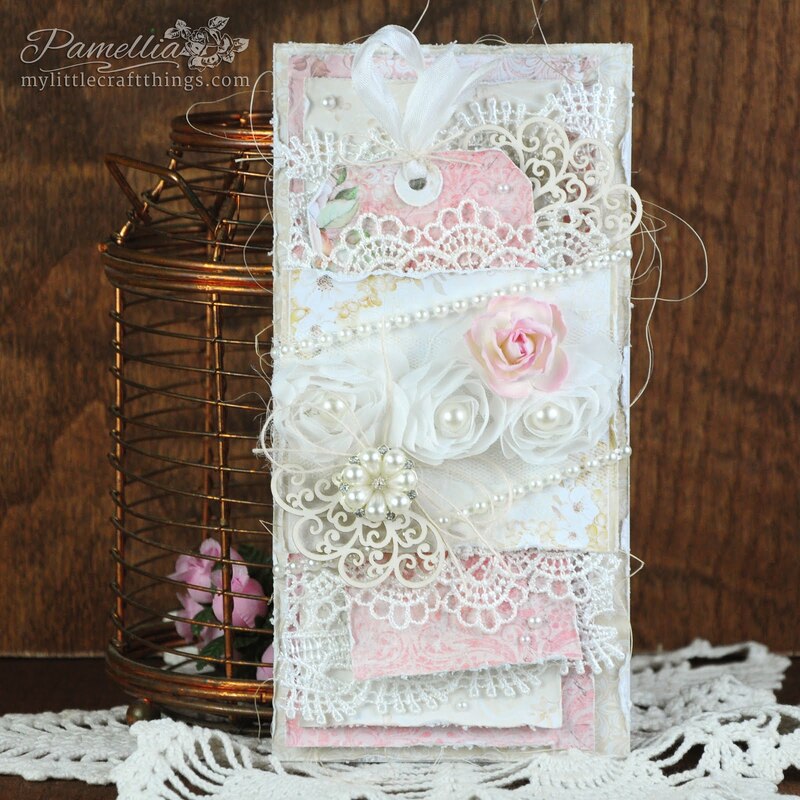 Gorgeous card Pamellia!!! 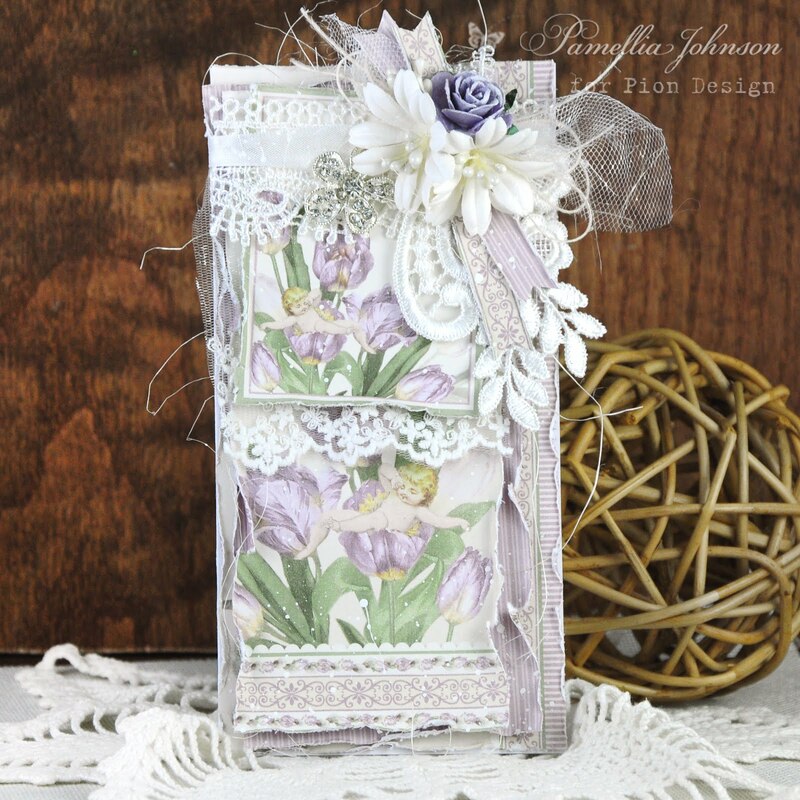 Love the design, colors, texture and all the pretty layers and embellishments! Sorry for checking in so late...I saw your card this morning, but had to rest my fingers and wrists for work :) The shabby bow is my absolute favorite, it is died so pretty, I can't stop looking at it!!! Thank you for bringing so much beauty and joy into this world!!! 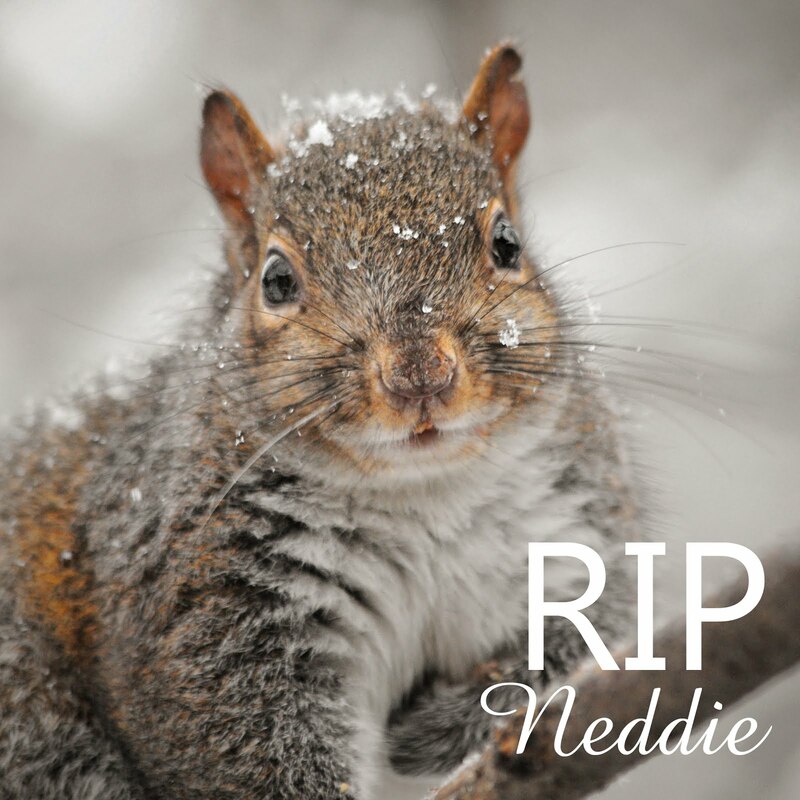 See you on the dance floor my friend! You've done it again Pamellia!!! Simply gorgeous...your talent absolutely floors me!! Love the colours, the technique, the embellishing...well heck simply everything is fabulous!! You are a MASTER!! I LOVE the colors on this card- the brick layer is a perfect backdrop for the beautiful main panel! Love!!! A beautiful mix of colours, textures and shabby chic all rolled into one. Gorgeous stamping too. 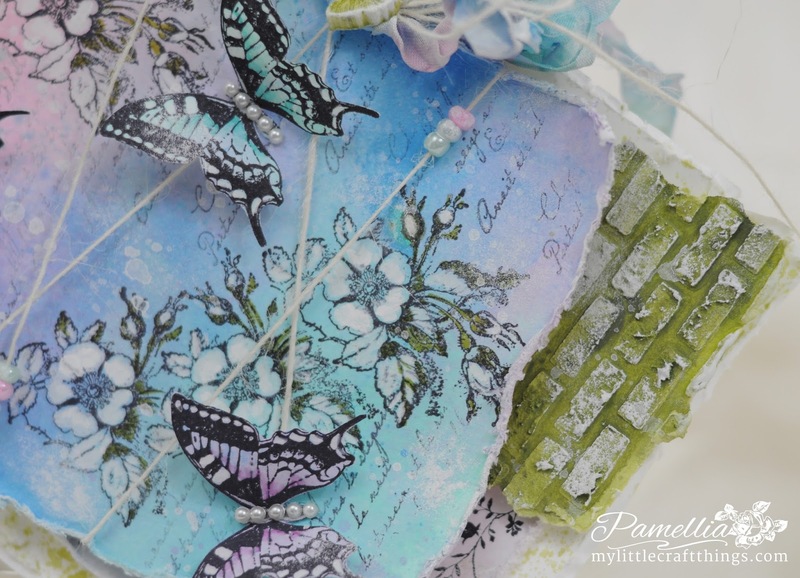 Loving the Textures style and colors Pamellia, your butterflies are stunning . 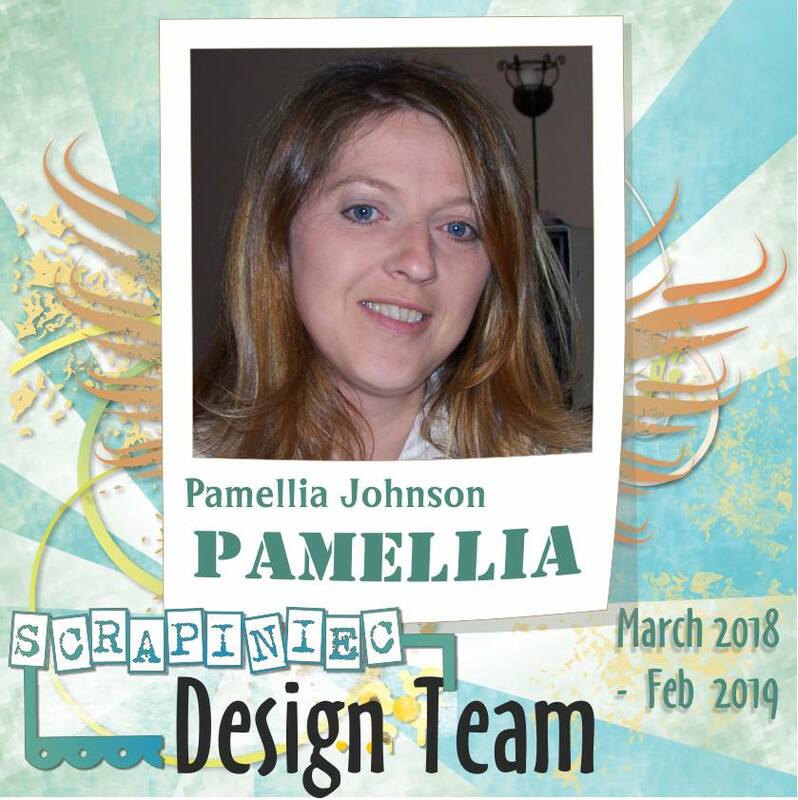 Wow, the brick walls looks amazing Pamellia. The background is so pretty and delicate and I love those butterflies, they are so sweet. Beautiful creation, Pamellia. Love the torn paper and butterflies. Thanks for joining the Sisterhood's "Come Fly With Me" technique. 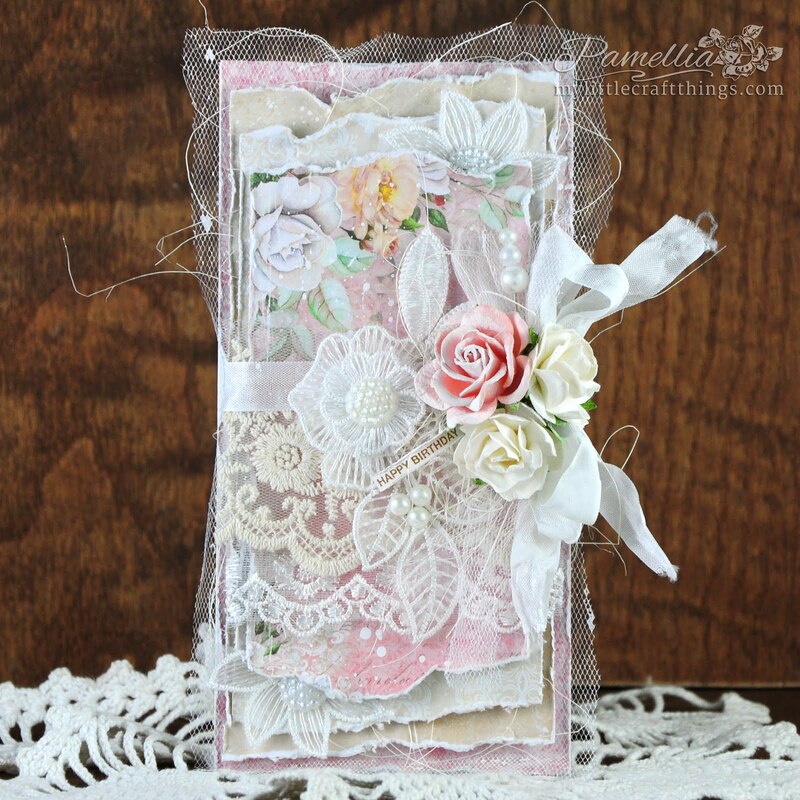 A stunning card Pamellia, such pretty colours and fabulous details. Your brick background is perfect for your beautiful flowers and butterflies. 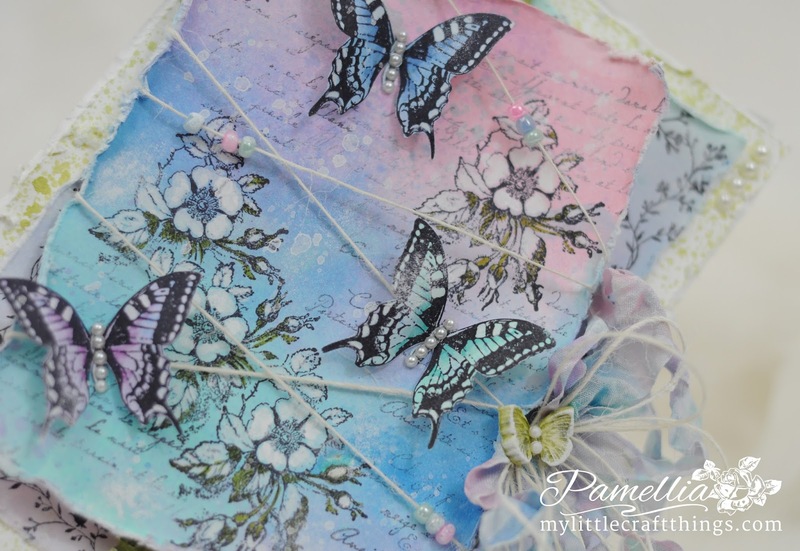 Really stunning Pamellia and I have completely fallen in love with that LaBlanche stamp, it looks fantastic the way you have masked it, and of course the butterflies are so lovely too! Really beautiful all together! STUNNING card, so many wonderful images out there that you can utilise. Your brick background is amazing and the perfect place for your butterflies to flutter and land on. Just GORGEOUS Pamellia! LOVE the soft, springy colors! Great job! Thanks so much for joining us at The Sisterhood’s ‘Come Fly With Me’ challenge and please come back again soon! Hi Pamellia, Have just sent you an email. Okay I don't even know if the word STUNNING is good enough to describe this card. WOW, it is absolutely gorgeous. I love all the details. Your work is amazing. 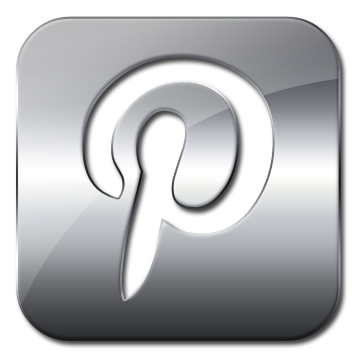 Thanks for playing along with our "Come Fly With Me" challenge over at the Sisterhood of Crafters. Happy Crafting! Breathtaking card Pamellia, those butterflies are beautiful so are the colours and design, I am in awe of your design work it always looks so detailed and totally amazing, that brick work in the background looks brilliant I love this so much. A vision of beauty and shows, there can be craft without Tim lol! A veritable work of art my friend. Pamellia, the first thought that comes to mind is Beautiful! OH that brick texture is so perfect for those lovely butterflies. Love this! Hugs! Just gorgeous, I love the colors and the fab details. Oh, Pamellia I am in love with this! That La Blanche stamp is fabulous and I love how you stamped the background! What can I say - amazing colors as usual, brilliant texture and awesome embellishing! The butterflies are stunning! Thank you for the great inspiration my super talented friend! Bravo! BREATHTAKING!!!! Pamellia, could it be I have a new Pam favorite here??? Every detail is just amazing...the masonry is perfect, the coloring on your background is true artistry, the butterflies so pretty and delicate. And you made the stencil yourself? Wow! I sure could use that for a little garden project I am working on! Sorry, I'm late to the party! I actually viewed this earlier, but got side tracked when I went looking for this crafter's clay you speak of; is that Martha Stewart? Must get some, because my paper clay always curls up, so I have a bunch of expensive trash when I'm done! Great card, and if you should save it for a certain January birthday, I'm sure it would be very well received! Big hugs! This is so pretty Pamellia and those bricks are amazing. Oh those colours are so gorgeous! 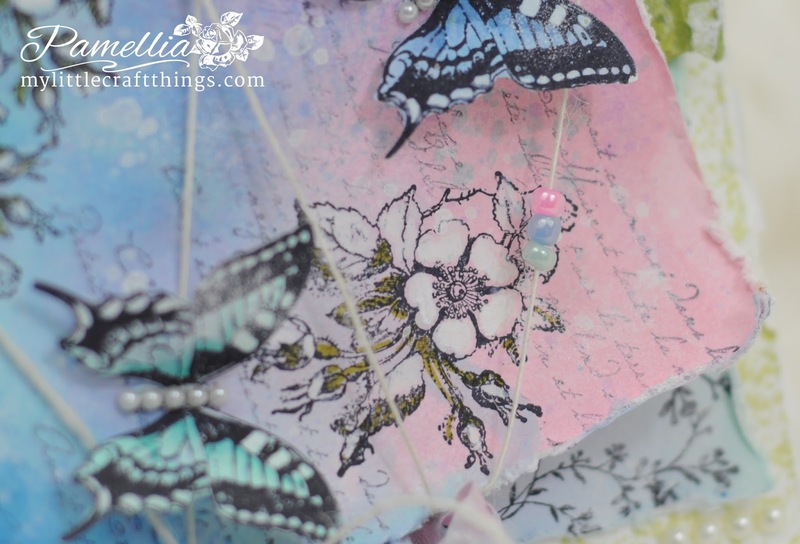 Such a beautiful card, I love the butterflies and your gorgeous design with the twine and beads. I am totally lovin the fact you didn't you any TH products. Way to go and so hard to do but you made it look posh and easy! You wear many hats when it comes to mixed media Bubbles! Rock on girl, rock on! Big Hugz! Gorgeous creation. 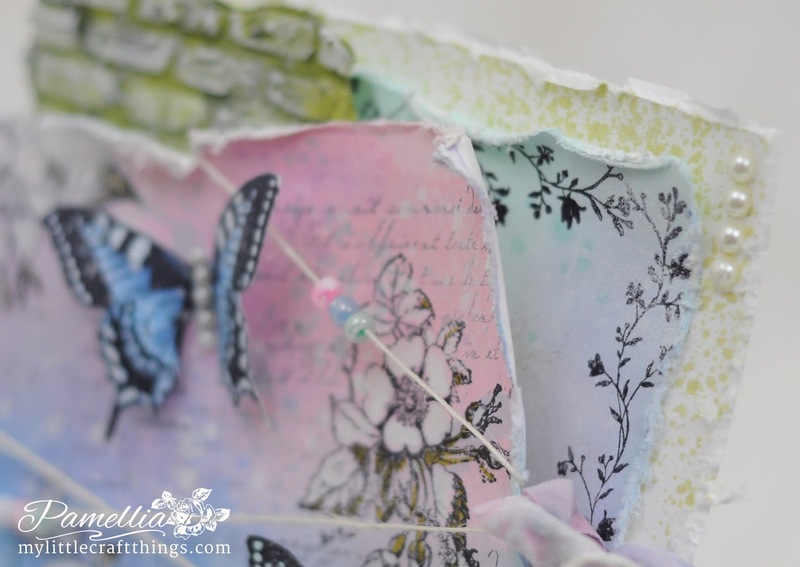 Love how the colours on the main panel blend so beautifully and the stamping is wonderful. The twine with beads is a sweet touch. 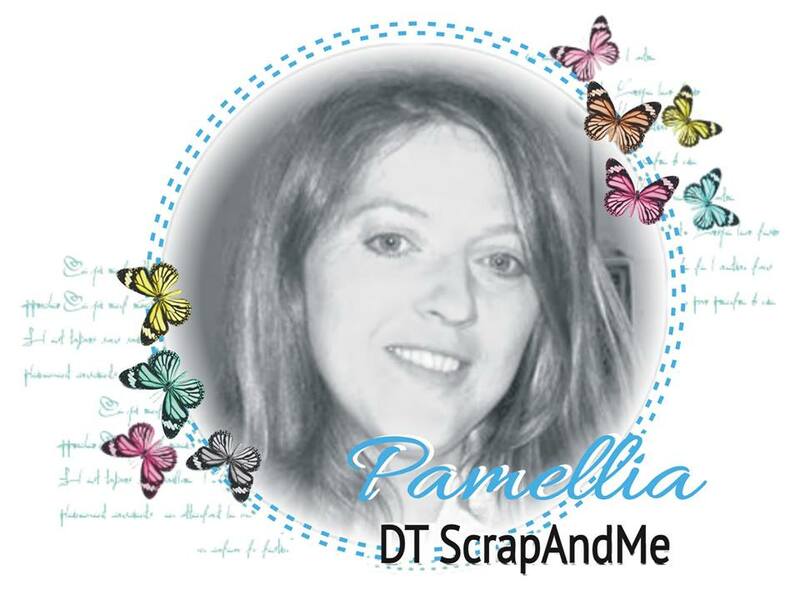 Pamela, your card is beautiful and amazing...so gorgeous!! Thank you for joining us at "The Sisterhood" for our "Come Fly With Me" challenge! I'm sure Tim will forgive you for making this one project without his stuff. 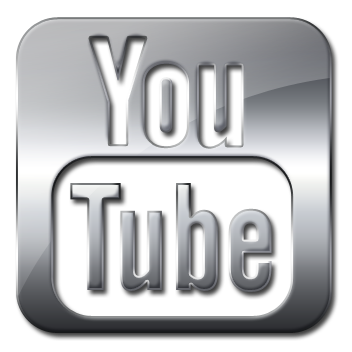 ;) I know you love his products, but you know what? Even without using them you managed to create a stunning piece of art. Such beautiful soft colours and lots of butterflies. <3 <3 Amazing! Beautiful! 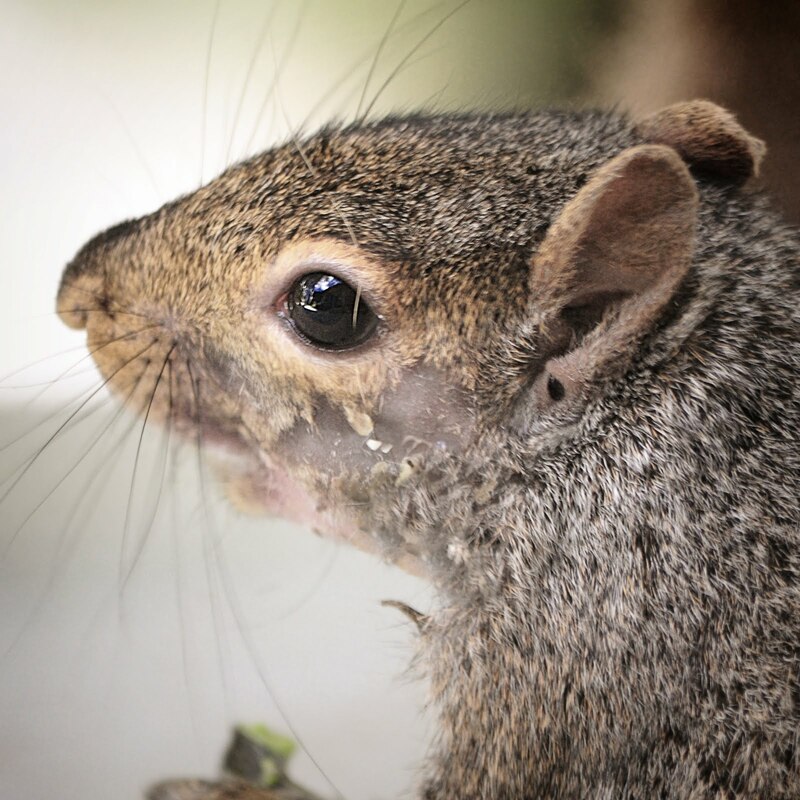 Thank you for sharing at FSC! So so pretty. Just to be perverse, I went past the lovely butterflies and fab spritzed paint panel... I especially love the weathered brick in the background! Oh my goodness, no TIM HOLTZ products… LOL! It's beautiful. 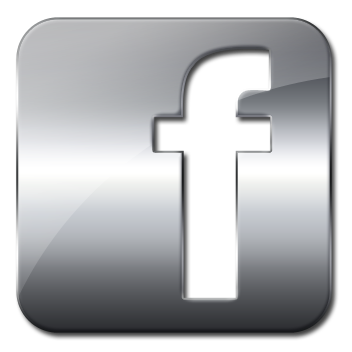 Thanks for your earlier vist, blessings! That is stunning Pamellia! Off to see your tutorial afor Decoart as I have never had any success marbling with Decoart paints and your results are just gorgeous! Frilly and Funkie - Put a Ribbon on it! Frilly and Funkie - Bring on the Bling!